The New York Section of the American Chemical Society continues its tradition of supporting chemists, mentoring students, and engaging the public. The following summary is a description of the superlative activities of our subsections, topical groups and committees, beyond those that appear in our Top Ten list. The Brooklyn Subsection held 2 events this year. The annual poster session for high school students took place on Sunday, October 18th at St. Joseph's College. There were 32 posters presented in this year's event, with students from 5 local high schools. Zhaohua Dai, Ph.D., of the Pace University Chemistry Department, presented the keynote address related to synthesis and application of ligands for metal ions that can be used as chemical sensors. His address was entitled "Sensor Research and Forensic Science." The Twenty-Third Annual NCW Brooklyn High School Day was held at Brooklyn College on October 22nd, involving approximately 150 high school students, chemistry student affiliates and faculty. The program included chemical demonstrations, a tour of the laboratories, an awards program, refreshments and the Twenty-Fifth Annual H. Martin Friedman Lecture featuring Columbia University Biochemistry & Molecular Biophysics & Microbiology Professor Maxwell E. Gottesman, with an address entitled "The Beautiful Life of a Simple Virus." The Brooklyn Subsection also held two organizational meetings at Polytechnic University this year to rejuvenate activities in 2010. Plans were made for future activities and new officers chosen. 2009 was a year rich in activities at the HBS, beginning with four meetings featuring social hour, dinner and lectures by invited speakers and culminating in a planning meeting of the Executive Board and the Board of Directors was held in November, 2009. Activities geared towards students included a Preprofessional and Career Fair in February, with participation from professional and graduate programs and companies hiring science graduates. Students' academic achievements and research were acknowledged at the Student Achievement Award Night, in April, and students involved in research presented their results in an Undergraduate Research Symposium held the same day. The subsection continued its cooperation with the Sigma Xi chapter of Ramapo College and the chemistry clubs of member colleges (Fairleigh Dickinson University - Metropolitan Campus, Ramapo College, New Jersey City University). HBS also brings chemistry and community together by organizing events (in March and November) for area high schools students, introducing them to chemistry and life beyond high school. In honor of National Chemistry Week they were invited to FDU where they were told about careers in chemistry, and hands-on activities were organized as well. The section also organized two sessions of "The Magic of Chemistry",attended by over 600 high school students. The LI Subsection, with new leader Dr. Shin at the helm, continues to be a vibrant and active section. Eight Board meetings were held in 2009, as well as seven seminars followed by dinner. The LIACS Chem Challenge, a "Quiz-show" competition, featured sixteen teams (3 students each) answering 30 multiple-choice questions from General and Organic Chemistry. 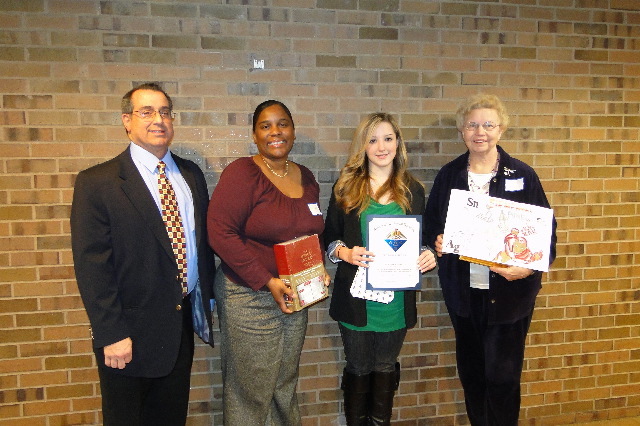 The LIACS High School Awards Ceremony was held on June 9, 2009 at St. John's University. Awards were presented to students receiving the highest mark in chemistry from Suffolk, Nassau and Queens high schools, with 26 students nominated. The event featured a seminar by Dr. Denton Ebel of the American Museum of Natural History who spoke about meteorites and their formation and properties. The Sterrett Symposium, which had been cancelled last year in favor of MARM, was back in its normal position on May 21. The theme of the Twelfth Frances Sterrett Environmental Chemistry Symposium was "Reducing Out Ecological Footprint." In keeping with the ACS goal of increasing collaboration with other scientific organizations, the Sterrett Symposium was co-sponsored by the Metro New York Section of the American Institute of Chemical Engineers. The Staten Island Subsection has had a distinguished history of activity under the Leadership of Wendy DeProphetus Driscoll. She is now stepping down from that position, and the subsection is in transition as new leadership steps in. Dr. Sencen is new to leadership in the Westchester Subsection, and has continued the impressive record of activity set by his predecessors. The section held five Free and Open to the Public meetings, with a capacity crowd of 25, at the NYU/Poly Graduate Center. In May, they held their annual Distinguished Scientist Award dinner, at Pace University, honoring Dr. Thomas Hintze from the New York Medical College. At that same meeting, awards were given to undergraduate students who excelled in chemistry during the year. For the first time, a high school student was also presented an award because of her achievement on the Chemistry Olympiad exam. In April 2009, 10 students from a local high school, trained by the Chair, performed science demonstrations and hands-on experiments for more than 2000 people at the Westchester Kids's Fair. In keeping with our section goal of increasing collaborations, the Analytical Topical Group has formed a partnership with The John Jay School of Criminal Justice, resulting in improvements in attendance and interest. The students in the graduate program in analytical chemistry at The City University of New York are required to attend the seminars and the forensic science students from John Jay can get seminar credit for attending. Last year we only had one seminar as we were reformatting. We have rescheduled the three fall 2009 seminars for January 22, 2010. New CUNY faculty will be presenting the seminars as part of the Chemistry Doctoral Programs Seminar Day. The mission of the Group is to advance the chemical and related industries and help its members by promoting networking and organizing events where industry leaders can give their insights on the business, economic and technological developments in energy, materials and life sciences. To this end, the Group held monthly luncheon meetings from September through June on the first Thursday of each month. The December meeting, a full day conference on Energy and Resources, was co-sponsored with the New York Chapter of the American Institute of Chemical Engineers. Meeting attendance was increased during the second half of the year by increasing promotional activities including: global webcasting of meetings, establishing a LinkedIn group for increased networking worldwide, and enhanced mailings using Constant Contact. The group also began the updating of Bylaws and supported an ACS Scholarship Program. This group was re-invigorated in 2009 under the leadership of Dr. Jang. The new committee dedicated most of their efforts to planning a new event, New York Theoretical and Computational Chemistry Conference (NYTaC3), to be held in January of 2010. The objective of this event is to establish a network of expert researchers and students from academia and industry and to help them share their experiences and ideas so as to nurture new collaborations and synergistic activities. In addition, this will enhance awareness of the successes and the promises of theoretical and computational chemistry within the broad scientific community in greater New York area. There has been discussion about changing the name of this group to more appropriately reflect their focus. We are fortunate in NY to have such a vibrant High School Teachers Group. In 2009 they organized eight meetings, with speakers guaranteed to excite the interest of the audience. Who wouldn't want to learn about the chemistry of barbecue sauce (Dr. Jerry DeMenna) or how to use magic to grab the attention of your students (Jay Rogoff and Chris Ward). The April meeting featured the ever-popular "Demo Derby" an evening of non-stop demonstrations (5-8 minutes max.) where participants just bring their demo, clean-up equipment and safety apparel, sign up, and go. Attendance was close to 70 at most meetings, and never lower than 37. Metro Women Chemists (Chair: Elise Megehee, Ph.D.).....FULL REPORT. The Metro Women Chemists Committee cosponsored a networking dinner on Thursday, May 28, 2009. The event was held at *Taro* Eclectic Asian Cuisine at 32 Church Street in Montclair, NJ. The evening's speaker was Anita Brandolini who talked about her 'Transition from Industry to Academe." The program was well received and 40 women were in attendance. Since its inception in 2003, the NY Nanoscience Discussion Group has enjoyed a steady gain in popularity. They meet four times per year at New York University. The science consists of three speakers, representing different areas of nanotechnology, in an informal and collegial setting. Guests are encouraged to arrive early to exchange ideas while enjoying a glass of wine and a snack before settling down to business. Events are promoted to an ever-growing list of 100 scientists in the tri-state area, as well as the 150 members of the NYU Department of Chemistry. The Organic Topical Group held two meetings last year: one in February with three speakers and one in June with five speakers, at the New York Academy of Science as part of the Chemical Biology Discussion Group. The meetings are regularly attended by 70-80 students, postdoctoral fellows, and faculty members from the Tri-state area. The group has followed the lead of our Biochemical Topical Group and has established a collaboration with the New York Academy of Sciences and their Chemical Biological Discussion Group. These meetings are highlighted on the web pages of ACS Chemical Biology and Nature Chemical Biology. The New York ACS Younger Chemists' Committee was reinvigorated in 2009 under the leadership of its new Chair, David Cormode. As a kickoff event, the Chair organized a social mixer held at the Galway Bar on 36th Street in Manhattan, on December 5th. Twenty five future leaders attended, enjoying drinks and chicken wings while meeting each other and making contacts. Chemists attended from Tarrytown, Long Island, Manhattan, New Jersey, Queens and Brooklyn. There were chemists from pharmaceuticals, plastics, medical schools, universities and patent law. Thus most subsections of the NY Section were represented, as well as a few representatives from the North Jersey Section, and multiple topical groups. The event was a great success and members are looking forward to an exciting 2010 with more programs. All of us in the NY Section are deeply committed to the advancement of chemistry education, both formally and informally, hence many of the education committees are described in the Top Ten List, including Chemagination, High School Olympiad, Project Seed, and the Undergraduate Research Symposium. Also under this category I am pleased to report the NY Section's acquisition of the Merck Index, generously donated to the ACS by Merck. The section submitted a request for 1000 copies to be used as awards at activities throughout the section. We were tremendously excited when approximately 3 tons of books were delivered to the section office in November (though I assure you the lone delivery man did not share our enthusiasm). Copies of the Merck Index have been dispersed to subsections for use in upcoming high school award ceremonies, to colleges for recognition of achievement in undergraduate chemistry, and to committees for activities such as Chemagination and the Undergraduate Research Symposium. All high schools participating in the Olympiad will receive a copy. We are extremely grateful for this donation, and dispersal will continue throughout 2010. In keeping with the NY Section tradition of developing new leaders, two new co-chairs were appointed to this committee in 2009, both former winners of this award. The committee membership, also new, was drawn from across the geographic areas of the section. Mr. Steven Borneman, of Byram Hills High School in Armonk, NY, was selected to receive the 2009 Nichols High School Teacher Award. Mr. Borneman holds BS, MAT and MS degrees in Chemistry from SUNY Binghamton, and in the words of one of his students, likes to get the class involved in SHOCK FACTORS which are some of the best demonstrations. The award, including a Merck Index, was presented at the section wide conference in January 2010. Activities of this committee have focused on recognizing the high achievement of high school chemistry students. All of the subsections have awards nights, and other committees are frequently involved in award programs. As part of the section�s review of committee functions, we are discussing the responsibilities that fall within the purview of this committee. Activities for this Committee consisted primarily of email exchanges regarding interest for a position by job-seeking candidates and the availability of jobs in industry and/or academia. The responsibilities that fall within the purview of this committee are under discussion as we review our committee functions. The INDICATOR continues to experience significant financial difficulties. The North Jersey Section decided to follow the New York Section lead in going to an electronic copy, though many people still desire a hard copy. In 2010 it will be decided whether or not to continue any hardcopy mailings. The membership committee maintained its efforts in keeping members informed and interested in section and subsection events. Innovations included bulk mailing of postcards announcing multiple meetings, and a new e-mail system that allows us to personalize e-mail messages. The 2009 award was presented to Dr. David Sarno, of Queensborough Community College, for his contribution to the Section in administrating MARM. Dr. Sarno received the award at the Section Annual Meeting in January 2010. The committee consists of the five past winners of the OSA and it solicits nominatons from April to June. The Twelfth Annual Frances Sterrett Symposium was held May 21, 2009 with the theme "Reducing Our Ecological Footprint." In keeping with the section goal of increasing collaborations, the symposium was co-sponsored this year by the Metro New York Section of the American Institute of Chemical Engineers, a relationship that will continue. Due to the off economy in 2009, it was decided that the NY Section would not spend money to solicit donations. Most fundraising activities were carried out by the individual event organizers. Fundraising was fairly successful for the Undergraduate Research Symposium, National Chemistry Week, Chemistry Olympiad and the Nichols Award Symposium. Speakers Bureau Committee (Database maintained by webmaster Brian Gibney, Ph.D.). A call for speakers appears on the main page of the NY Section website. Members can provide their data (name, contact information and title of talks) to the webmaster who uploads it to the online database of speakers. Those seeking speakers are also encouraged to contact the section for information. The committee recommends gaining experience in alternative ways of meeting for conferences/meetings. The recent change by ACS from WebEx to A+ is expected to reduce costs. There is a plan to enlarge this endeavor in 2010. The Section's financial information and books were reviewed and it was reported that all is in order. The Bylaws Committee has submitted updated NY Section bylaws to the Committee on Constitution and Bylaws. Issues considered for change deal with running elections electronically and the elevation of student affiliates to student members. The C&B has examined the proposed amendments and submitted their comments back to the Chair of this committee. The EAS represents a long standing collaboration between our two organizations. In 2009, Section personnel manned the New York Section booth in the Exhibit Hall, as always. The NY Section Chair (B.Hillery) also co-organized a full-day symposium on making the transition from academics to industry, and called on the expertise of several NY members as speakers, including the chair of the Academe/Industry Committee, Dr. Richard Goodmen. The New York Section is a sponsor and one of the founders of the EAS. In 2009 it attracted over 3000 participants. Numerous New York Section members sit on its Board of Directors. This committee met in October to review the section's current finances and budget requests for 2010. The committee developed a 2010 budget for presentation to the Executive Board at the November 13 meeting. LRP met four times during 2009. The LRPC recommended: resending the survey to committee chairs regarding revitalization, as response had been low previously; obtain student membership information in the NY Section from ACS data and observe any impact on Local Section membership; and promote Brookhaven National Laboratory as a candidate for the National Historic Chemical Landmark. The Jury met at St. Joseph's College where it selected Dr. Tobin Marks of Northwestern University to be the recipient of the 2010 William H. Nichols Medal. Described in the Top Ten.